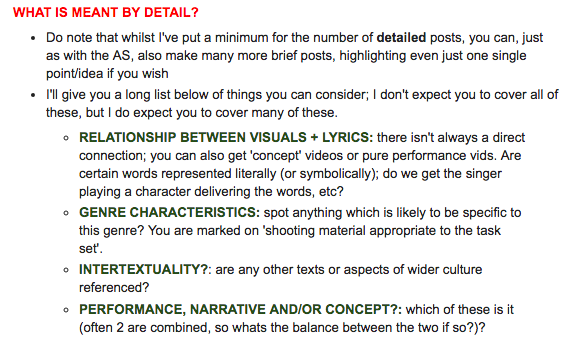 To help evidence research into, and knowledge + understanding of, the media language of music videos, you need to analyse a wide range of examples. So - you're looking for screenshots that will help you illustrate conventions. Always name the artist, track and year for any video you reference. If you can also screenshot 1 or more YouTube playlists (of videos you've viewed/analysed for your research) from your own channel, this helps show the range and depth of your research. I will play you annotated clips from some videos I've blogged on, done an earlier vodcast on, and added to a playlist. We will pause after each clip so you can see if you can spot at least 1 more possible 'convention' demonstrated by this video. That might include any of Goodwin's points (he sums up six features that his research claims define the typical music video). You will find the necessary hyperlinks in this very useful post.